Halloween #1 – Trick or Treating | Its a Hard Nut Life . This is the first post that i’m going to be writing on the scariest holiday of all, Halloween! Scary for most because of horrid costumes and blood, scary for myself and other N.A.S’s for a whole load more reasons! I believe that at my current age (19) that it is now “socially unacceptable” to continue to go trick or treating every year on Halloween (not that that stops me!). 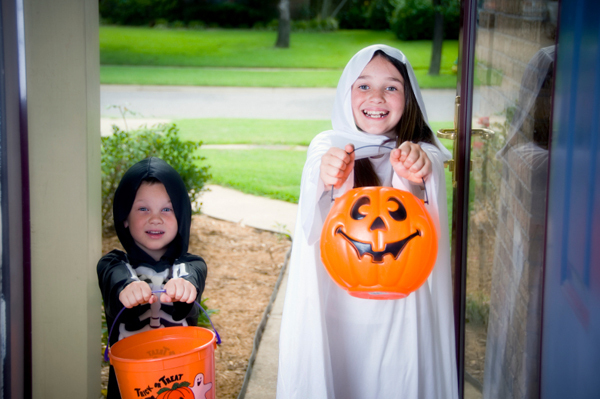 Going trick or treating is a must for anyone growing up. The chance to get dressed up in a scary costume and go round people’s houses asking for sweets, sounds like paradise doesn’t it? Well unfortunately to me it used to and still can be a bit scary because one person’s “treat” can be another person’s trick. This is one that I found particularly useful and that I would certainly recommend. Picking an outfit that would generally include gloves or something to cover your hands is a great way of avoiding contact with those unwanted reactions. As long as you can somehow work a pair of funky-looking rubber gloves into your costume then that’ll help in preventing you from having a reaction. So lets say by chance that you dive into a neighbour’s trick or treatin’ bag and happen to pull out a slightly open Hershey’s bar. Now you DON’T have to scream and run to your mum, you can just drop the sweet, wash the gloves, take them off, wash your hands and you’re safe! this is a great subtle way of protecting yourself from touching any unwanted killers and they’ll make you feel more confident and reassured that you won’t drop dead! This is kind of an obvious one but none-the-less and very necessary rule to keep in mind. When going trick or treating with your friends and they’re all eating their sweets after a successful raid, it can be very tempting to join in and munch away at your goodies. The best advice I can give you is to just not eat them, well unless they’re individually wrapped in a packet of their own and you are 100% sure you can eat them. If not, just save them for when you’re safe and sound at home and can look at the packets clearly and carefully. It might be tempting to eat your sweets with your friends when they are and if you find yourself getting embarrassed that you can’t, just bring along a couple of safe treats that you can eat and that won’t kill you. Trick or treating is war kids. It’s war! The second your kind neighbour opens that door with a bowl full of sweets and you dive your hands in along with your friends, it’s like a battlefield down there! You try and grab as much as you can and whatever you can. Don’t. Just don’t. If you can manage to restrain yourself (it’s hard, I know! ), then you might live to see another day! Basically this rule is about not rushing your choice and clumsily picking a deadly sweet and instead about taking your time and picking something you are sure you can eat or nothing at all. And as a bonus, if you have great friends and they’re nice and lovely, i’m sure they’ll let you pick first so that you can choose some sweets that you can eat! So like always, if any of you out there have any more advice or questions about trick or treating, don’t be afraid to drop me a comment or message. Thanks for reading and there’ll be more on the touchy topic of Halloween to come. reading this enormous educational post here at my home.